I had the good fortune to meet the iconic photographer Albert Watson recently, in Palm Beach, and we talked passionately about inspirations and approaches. Albert has long been one of the world’s most acclaimed fashion photographers, but he has no fondness of being pigeonholed – some of his favourite images are from his series of landscape shots taken on assignment in the Isle of Skye. I will always remember his words about that particular assignment. He talked about his fear of being banal and taking “picture postcard images” – after all, Skye is heavily photographed. It was vital, he said, ‘to have imposed himself ” on the landscape rather than the other way around. I left for my latest visit to Rwanda with his comments fresh in my mind. I have learnt in the jungle or rainforest that a photographer cannot let the environment dictate the way to film – that is simply not good enough. To impose oneself in the rain forest habitat of Silverbacks, 10,000 feet up, requires respect and at times, a rather brazen approach. For this portrait I wanted to work with as short a lens as was technically practical. This meant getting as close as possible without incurring the wrath of either the silverback or the lead ranger that is always around the corner. It is not so much a question of breaching rules, as putting oneself in a situation where the distance to the subject can shorten legally. Focus is the key word in photography – it explains, frames and excludes. I am proud of this photograph – it has a calm simplicity which belies the spontaneity of thought that went into its capture. 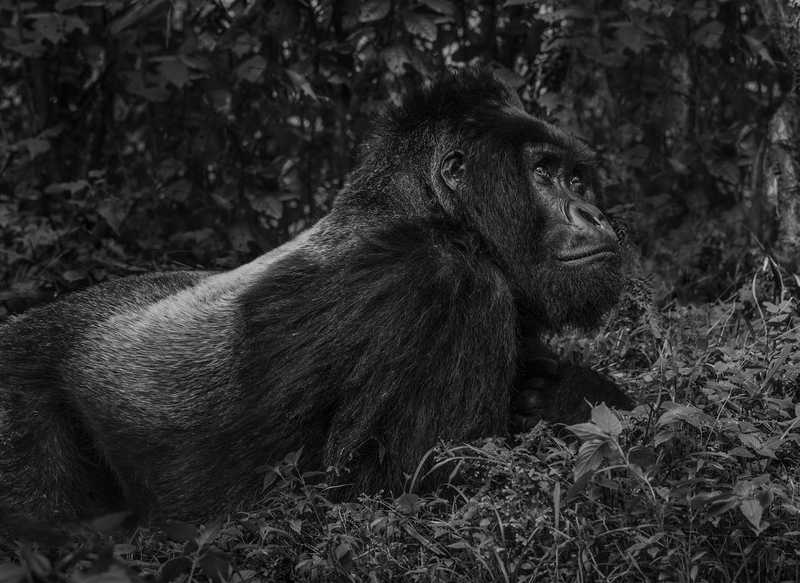 I wanted to take a portrait of a silverback’s body and face, where the detail and sense of intimacy could transcend my earlier work. Albert was so right – I just had to impose myself. At life size, this print really is quite special.